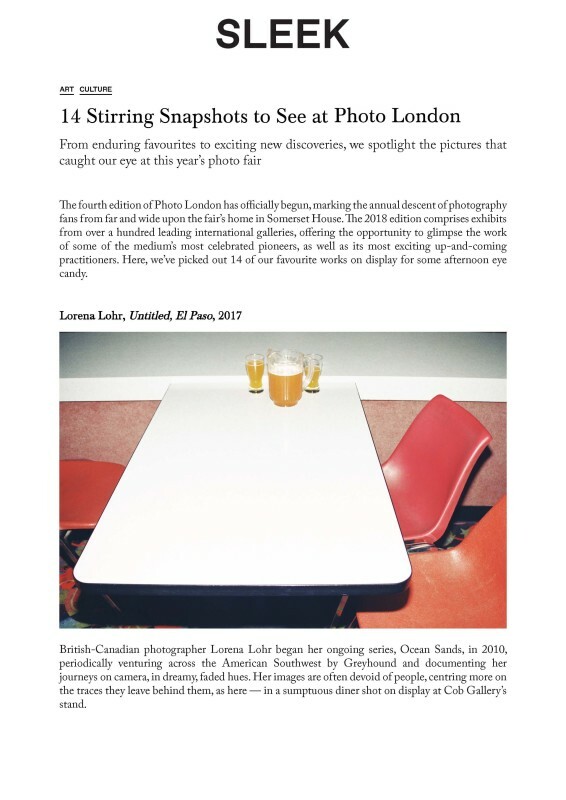 The fourth edition of Photo London has officially begun, marking the annual descent of photography fans from far and wide upon the fair’s home in Somerset House. The 2018 edition comprises exhibits from over a hundred leading international galleries, offering the opportunity to glimpse the work of some of the medium’s most celebrated pioneers, as well as its most exciting up-and-coming practitioners. Here, we’ve picked out 14 of our favourite works on display for some afternoon eye candy. British-Canadian photographer Lorena Lohr began her ongoing series, Ocean Sands, in 2010, periodically venturing across the American Southwest by Greyhound and documenting her journeys on camera, in dreamy, faded hues. Her images are often devoid of people, centring more on the traces they leave behind them, as here — in a sumptuous diner shot on display at Cob Gallery’s stand.